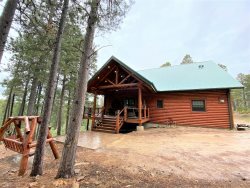 Browse all of our beautiful cabins in the Black Hills. Click on each property below to browse photos, check rates, see availability and much more! We have many great options for very large groups that need more than one cabin for their stay! Check out these links below for cabins that are located next door or within walking distance of each other. Here are the homes that are available for Sturgis Rally. These cabins are between 3 and 5 miles from downtown Deadwood. Youll be minutes from food, entertainment, historic sites and museums, and casinos! These homes are all near the Terry Peak ski area. Whether youre looking for a ski-in/ski-out lodge or for a cabin with a little more privacy we have a home for you! Snowmobile/ATV trails are nearby as well! These 7 cabins are all right on Terry Peaks Stewart Slope and provide ski-in/ski-out access! Peak1 sleeps up to 22, Peak2, Homestake, Holy Terror, Black Moon, and Avalanche Chalets each sleep 14. Kussy Chalet sleeps 10. For very large groups all seven cabins can sleep up to 102 guests. 7 miles from Deadwood. Book early, these cabins go fast! You can ride your snowmobile or ATV directly to and from these properties. These cabins have great views and private lots for a nice, quiet getaway. If you want to feel like youre in the middle of nowhere right in the heart of the Black Hills these cabins are perfect for you! This property is pet-friendly with prior approval and fee. These properties are located in Northeastern SD right on Waubay Lake. This area has some of the best hunting and fishing in the Midwest!